The hardscrabble Pennsylvania borough known as Donora wasn’t even a speck on a map in 1900. Four plantations consumed the land hugging the 4.2-mile stretch of the Monongahela River for more than a century before a new steel town came to life. Along with wheat and barley, the farmers planted walnut groves and weeping willow trees to separate their property lines in what was once part of Carroll and Fallowfield townships. The sharp curve in the river at the base of a foggy valley would never look the same after entrepreneur William H. Donner of Indiana surveyed the area’s rich coal deposits that he could turn into steel and boost his fortunes. 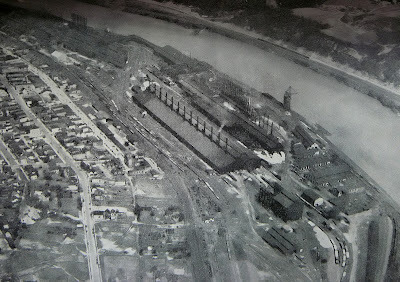 Donner had no trouble convincing Andrew William Mellon, a Pittsburgh banker and industrialist, to invest in his scheme to establish a new wire mill there because of his success in a budding tin mill across the river in Monessen. As a result, Union Steel Co. was born along these banks of the Mon to compete against steel baron Andrew Carnegie. The borough would be incorporated in 1901 with a name that was inspired by combining the Donner family name with the Christian name of Mellon’s wife, Nora. 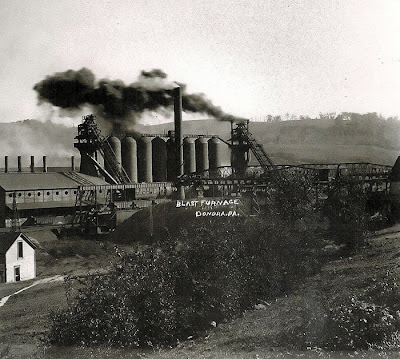 Within two short years, Carnegie's successors bought out Donner and folded the Donora project into a monopoly they were creating with U.S. Steel Corp.
And the world was watching. Land speculators camped beside the stakes that marked vacant lots the night before they were sold at an auction that began with the sound of a gunshot sharply at 10:30 a.m. Sept. 10, 1901. By nightfall, more than $100,000 changed hands over 200 parcels of property while Donner was carving up the land along the riverfront. U.S. Steel later announced plans to invest $20 million to build the world's largest rod, wire and nail mills in the borough. Within a year, there was a severe housing shortage as immigrants scrambled for some 10,000 jobs that were supposed to be created. The housing famine worsened after 1915 when the corporation unveiled a $3 million zinc works, the size of which had no rival. Local health officials were worried about the spread of disease because families and borders were practically sleeping on top of each other. In some ways, Donora was much like the many other wealthy mill towns that were sprawling across the Pittsburgh region. There were 147 businesses in the borough, that combined, were doing more than $3 million in sales a year at the end of the Great Depression. Everyone either worked at the mill or toiled to feed and clothe its laborers. Work was especially tough in the zinc plant, which employed many Spanish men because they had the stamina to withstand three-hour intervals beside its 120-degree smelters. They had to lift 60-pound ingots to keep their jobs, and stock a steady supply of new clothes because their shirts and trousers disintegrated almost overnight from exposure to acid. But historians have never been able to explain why the town became a magnet for some of the most violent and radical immigrants from Europe. As early as 1902, local police were stationing themselves at Slavic weddings because of the shootouts that were taking place at their receptions. Police officer Clarence L. Eaton was shot to death that same year at a dance grove. Three years later, borough officials were launching crusades against gambling and attempting to shut down bars over fears of violence when the mills closed for repairs. As the nation entered World War I, 40 percent of the mill workers in Donora gave the draft a false address in a show of protest against the federal government. It was an unusually high number and a further indication that the town was home to rebellious Socialists who sympathized with Germany. During the first U.S. steel strike in 1919, a band of steelworkers even set off dynamite at the homes of two of their coworkers who crossed their picket lines. Another angry mob of striking workers, their wives at their sides, assaulted and disarmed the police chief when he escorted mill bosses through the gate to the zinc plant. The labor dispute was marked by other riots, one of which involved 50 men who threw bricks at black men who the company had hired as scab laborers. Work resumed, but, the dark clouds never lifted above those cramped houses that climbed the steep hills beyond the smokestacks at the river's edge. The source is microfilm at Donora Library. I didn't keep a copy.